Most of us would agree that this is being fulfilled throughout the many different Disney venues in the entertainment world. Just watch your kids light up when they go to one of the Disney parks, or think about the warm and happy feeling you get when watching a classic Disney movie. 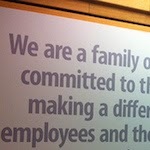 Companies that create thought-provoking mission statements that are on-the-mark get everyone involved in the process. Start by having each physician and staff member, as well as 25 to 30 patients, fill out a form describing their impression of the practice’s purpose. This can be a real eye-opener. It can be advantageous to dedicate an entire day or weekend to developing the mission statement and to hire an objective professional to guide the process. Include all physicians, and get input from staff members in this process; if you don’t, you will compromise the outcome and may not get the support needed to achieve success. Ask yourself and other members of the practice team how they view the practice’s mission, and what behaviors or accomplishments have been instrumental in forming their impressions. Focus on the key attributes of your business to get you to the reality of the practice’s mission, based on existing services and products, attitudes and behavior demonstrated, the goals the practice sets each year, and how hard the practice works to achieve those goals. Most importantly, remember to keep the mission statement clear and brief. In the end, the patient should know what to expect from your practice, what its values are, and what the practice is doing in the community—and these attributes need to be consistent. If you are unable to commit to a consistent program to fulfill the mission and have it realized by your customers, then there’s a good chance you haven’t developed the right mission. * Judy Capko, of Capko & Morgan, is the co-author of The Patient-Centered Payoff: Driving Practice Growth Through Image, Culture, and Patient Experience. A must-read for patient-centered practices.